I can’t tell you how many times I’ve come in to my blog, started typing–maybe even finished a first draft of a post–and then ultimately not posted. When I first got pregnant, I promised I wasn’t going turn this into a “mommy blog” or a pregnancy blog. I really didn’t want to do that. But then I found that the self-imposed limitation had completely shut my mouth. My unofficial hiatus has become a source of shame and sadness for me. I love this blog, I love interacting with readers and I love the thought that some of you have found something interesting or helpful here. The start-stops have really weighed on me, but I have been fretting over this puzzle of how to follow the self-styled mission with this tiny pink elephant in my womb (and now my room). I even went so far as to create a new blog–the self-styled baby or something like that–with the intention of having two writing spaces for these two different “aspects” of my life. That did not work. But I think I’ve figured it out. If this blog is about my life, my self-styled life, there will have to be some baby in here. Because the fact is, my life has changed. It’s not that it took me 9 months to know that it would. But maybe it did take holding my squirmy little nuggy to feel the full impact of this shift. And it made me realize that the no-baby-in-blog restriction just wouldn’t work (and clearly hasn’t for the last … ten-ish months). So what are the plans for the self-styled life from here? Well, I’m learning that there’s a lot of crap-shooting in parenting, a lot of trial and error, and a lot of do it MY way, not necessarily how it’s “supposed” to be done. So the self-styled “rules” (that there are none, really) still apply. And through my parenting journey, I think I’ll probably learn some lessons that will be useful to you non-parents out there trying to cut your own unique path through an often inflexible world. At least, that’s my hope. Furthermore, while I’ve always seen my audience as the just-starting-out (baby-less) twenty somethings, I’m turning 30 this year. I’m not “just starting out” anymore–I’m pretty well in the thick of it now. Many of my friends and readers will be also starting families and struggling to balance babies with jobs and careers. This struggle is well within the parameters of the self-styled life. This struggle is not unique to me; there’s a lot of self-styled conversation to be had here. So, I’m back. With a baby. I’m sorry I left, I won’t do it again, and for now I’m just going to promise one post per week. And we’ll go from there! Welcome to the self-styled life: part 2. 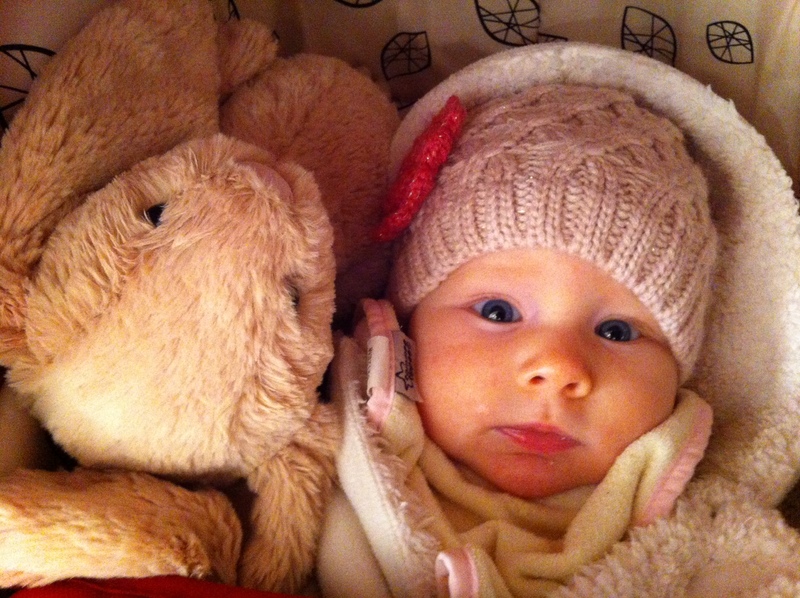 Snuggled in her stroller with her buddy, Lapierre Lapin. Welcome back. Glad to see that you realized that “baby” has now become part of who you are. It doesn’t change you but perhaps enhances you. Life is ever so evolving and has so many ups and downs. You may feel like you are on a ladder at times but things usually work out eventually. There is no “right way” or “wrong way” to raising your child. You take in all the information you receive and make “your own choice” and life will go on.Looking forward to having you back online. Yes, as with many things–no right or wrong, just different! Thanks for the comment! The integration of parenting and work is valuable insight to all of us- even the childless. We all struggle to fit more into our lives, live balanced lives, and navigate the times were there is absolutely NO balance. I look forward to following your adventure… and being part of it from time to time! Welcome back!!! You have great insight into the everyday, ordinary struggles of life. Often your perspective offers a fresh look at the mundane and pulls others to a new view…So glad you re back to prod and inspire! Precious bundle. I bet your parents are over the moon in doting. So goooood to see you back. PS Our grandson was born back in September. PS: I tagged you in a blog challenge. Challenging, it is, too! If you’d prefer no to play, I completely understand! It’s time consuming, and I know how little of that there is sometime. Have missed you but want you to know I’ve been thinking about you. I remember it was you who awarded my first blogging recognition in ’11.